According to a questionnaire survey by Market Intelligence & Consulting Institute in Taiwan (MIC), in connection with the problem faced while operating cross-border e-commerce, statistics show that obstacles within the top ranks such as, normal payment or logistics problems, information flow problem including customer profile analysis and after-sales service, and so on. Thanks to the agreement on cross-border payments formed through alliance by several traditional financial business including VISA, Master, and the P2P payment tools including PayPal, Alipay Global; Those classical conditions are no longer set limitations to cross-border e-commerce industry. But there’s still some tough bottleneck exist. Let’s focus on information flow problems. Do cross-border e-commerce truly understand what local customer needs? How will they behave on their mobile devices? Why over 90% of users drop out the store page before they ordered anything? How can cross-border e-commerce grasp the local customer profile without having an expedition to Southeast Asia? The main solution must be “digital advertising.” Statistics from IAB (Interactive Advertising Bureau) show that “online advertisement with Ad tech” has already exceeded “television commercial” and become the biggest single media worldwide which intensely changing customer behavior. To support brilliant eCommerce companies better penetrate different markets in each SEA countries, Tagtoo Media consolidate key points of customer behavior from several survey report, and present as Info-graphic to easily understand. We first pick Indonesia for deep observation and summary. According to survey result from GfK and Google, we can strongly feel the “Mobile Only” phenomenon happening in Indonesia. With 61% usership of smartphone, comparing to 17% usership of PC, Tagtoo strongly advise that eCommerce who are aiming to penetrate Indonesia marketplace, “First Mobile” online experience design absolutely plays a necessary role. Then how about customer behavior on devices? Statistics show that Indonesians spends an average of 5.5 hours per day on mobile, and the using peak happens at noon and evening. So your marketing campaign can publish both at noon and evening before 30 minutes, in order to expose your service or product to enough potential audiences. Furthermore, the top three frequent activities on mobile are social networking, searching, and gaming. One of survey on JakPat Mobile Apps indicate that, 85.32% users will have social networking at least once each day on mobile. By the way, Facebook owns the highest access(72.96%) as usual in Indonesia. So considering how to engage in customers social networking activities to having more word of mouth, enhance search engine optimization for official websites, and seamless integrate entertaining elements with your service or product to make consumers interested and perhaps, share or purchase it. 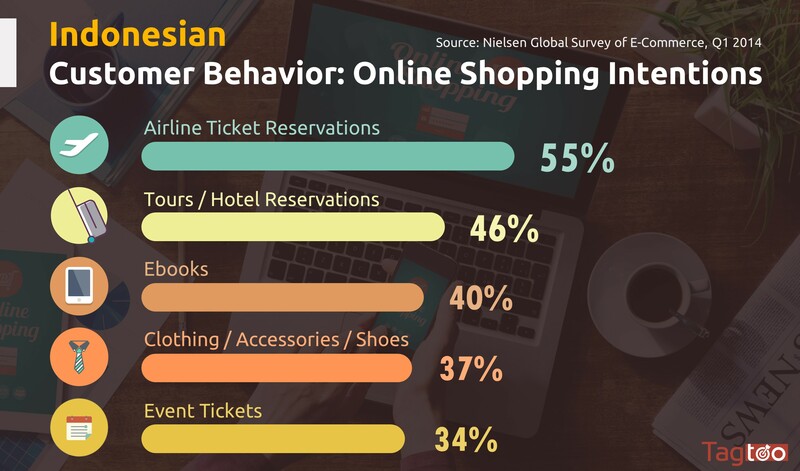 In the following info-graphic, let’s zoom in to “online shopping behavior”, which eCommerce Industry care the most. As you can see, travel services are the most commonly purchased items online in Indonesia. So Indonesians might also have more purchase intentions when browsing travel accessories. After taking a look at external influences, how mentally factors deeper affecting customer behavior. Indonesia digital consumers enjoy going online to shop especially when it comes to read online reviews and product research, as a means of checking out products to inform their offline purchases. Therefore, make sure your brand provides seamless online-to-offline experiences, in order to convert more royal customers. On the other hand, Indonesian consumers are really cautious when it comes to providing credit card information and having shipping costs online. Appropriate customer service may turn the tables to win loyalty and trusts from them. To summarize, understanding local customers has been more and more important in recent years. As smartphone widely popularize to Southeast Asia, eCommerce definitely can’t miss “Mobile First” thinking. In the modern age where information explodes every minute, the one who can accurately grasp what consumers thinks & needs, expose brand messages to the right people at the precise timing, revenue is in the bag.